This alternative take on a salad is fun to make and flavoursome! Heat a little oil in a frying pan or wok, add the tofu pieces and season with salt. Add 2 tablespoons soy sauce, saute, and stir tofu until brown before switching off the heat. Prepare the rice paper as per instructions on packaging. Cut the cucumber, carrot, purple cabbage. Add a small amount of the cut vegetables and tofu pieces onto one side of the rice paper sheet. Roll the nearest edge, tucking the filling in, rolling away from you. 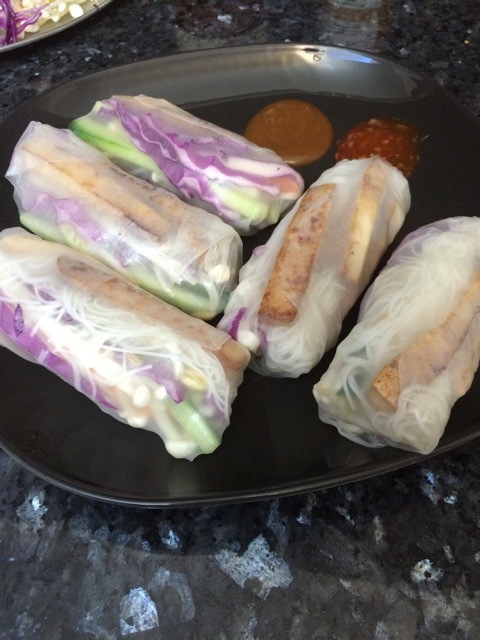 Chill the salad rolls in the fridge for 30 minutes. Serve with peanut sauce or sweet and sour sauce.